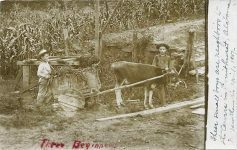 Borden Springs, east of Piedmont, Alabama was part of Calhoun County until 1866, when it became part of Cleburne County, Alabama. 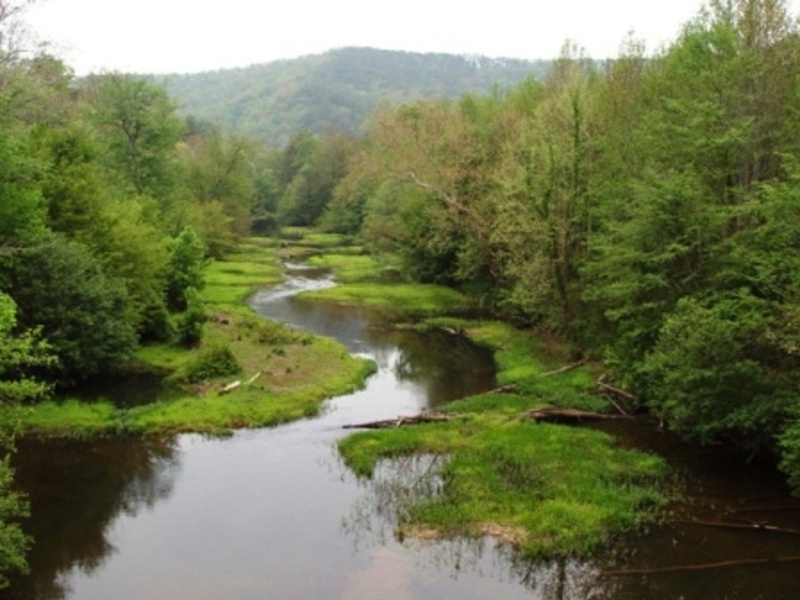 The area is located high in the foothills of the Blue Ridge Mountains in a valley between mountains that lie unbroken for fourteen miles on either side. 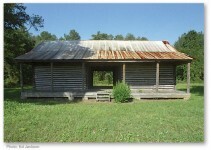 The earliest settler on the Borden property was John A. Borden from Huntsville. He owned one thousand acres west of the spring. There he built a grist mill at a bend in Terrapin Creek and nearby he built a large home with open hallway that extended the length of the house and living rooms on both sides. Arthur Alexander arrived shortly afterward and bought 160 acres which included the spring and land around it. His son, Matthew married John Borden’s daughter, Annie. The next pioneer was C. M. Wheeler, who bought the spring property. He married, Sarah, the daughter of Arthur Alexander. An interesting anecdote about the Wheelers occurred during the War Between the States when guerrillas came to the Wheeler home to take the youngest of seven sons, a boy of seventeen, to join their ranks. “Mrs. Wheeler had the boy go into the house and fasten it well, and then took her stand on a wide stone stoop in front, with a broadax concealed beneath the folds of her capacious apron. When they rode up and demanded the boy, she said: “If my son were of age to be in the army, he would be there, but he is not of age and he is not going.” At a threatening move on the part of the men, the ax came out and was lifted high with both hands. “If any man puts his foot on this step, his head will come off,” she warned. Perhaps the men were moved with admiration of such courage, and some fear, too, for they quickly left. 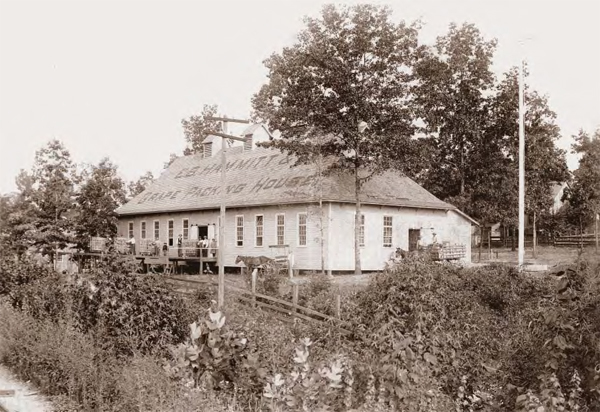 Prior to 1894, a hotel was owned in Borden Springs by the Fruithurst Company, a group of Swedish families who came from Minnesota for the purpose of raising grapes for making wine. 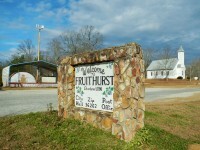 They established the town of Fruithurst. The glory day of Fruithurst were brief and now only a few remnants of the once blossoming colony are left. However, today, it may be making a come back with a new winery that has opened. Named the Fruithurst Winery, it operates in conjunction with Laminack Vineyards and offers an array of different table wines. “The hotel building, established originally as a clubhouse for prospective land buyers, was short-lived, for within a few years the company went defunct. 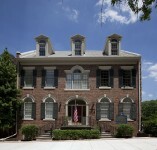 The Borden-Wheeler Company purchased the clubhouse and employed J. C. Bass of Carrollton Georgia, to dismantle the structure, move it sixteen miles to Borden Springs, and reconstruct it as the Borden-Wheeler Hotel.”i It was moved with the aid of mules and wagons. When rebuilt at its new location, the structure had wide porches, broad wings, and was surrounded by mountains covered with pine, maple, oak, elm, gum trees, ash. Soon there was a village of cottages around the hotel which harmonized with the background of trees. The hotel had over 100 rooms, 9 concert pianos, running hot and cold water, electricity, a large outdoor swimming pool, a dance pavilion, and a golf course. Numerous French chefs prepared the guest meals. 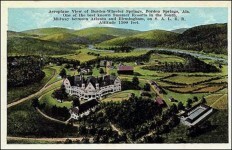 The Borden-Wheeler Hotel soon became known as a lavish week-end resort. Orchestras furnished music during meals and dancing was the best that could be obtained in Alabama and Georgia. 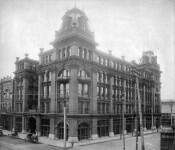 The Borden-Wheeler Company sold their holdings to J. C. Bass, who had moved the building from Fruithurst and he operated the hotel until his health failed in 1920. 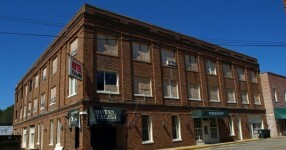 His son continued to operate the hotel until 1927. 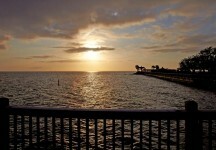 Then he sold the property to a Florida company headed by Leon Prine of Fort Meade. The hotel was closed in 1933, probably due to the Great Depression. A tragic fire destroyed the hotel in 1935, leaving nothing but ashes. 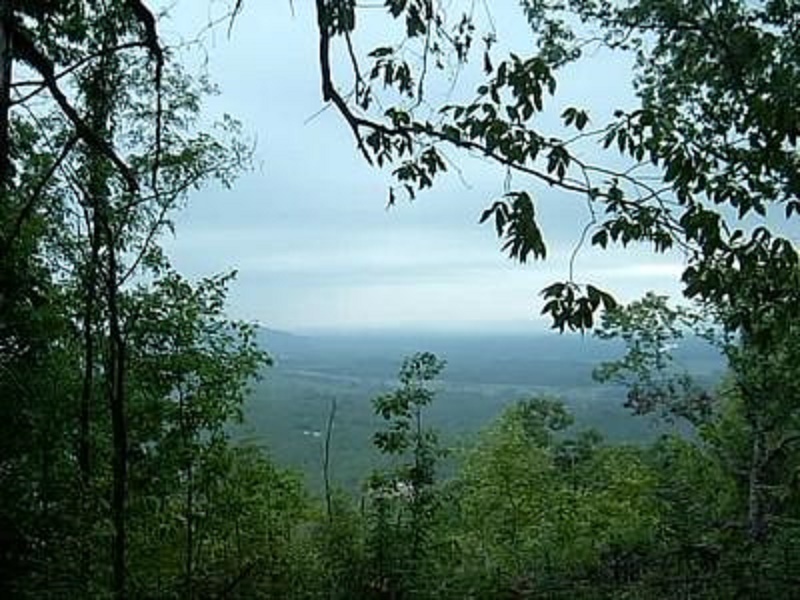 is a collection of lost and forgotten stories of the first surveyors, traders, and early settlements of what would become the future state of Alabama. 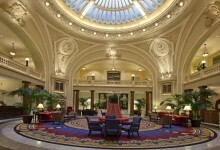 Does the Thomas Jefferson Hotel have the last rooftop zeppelin mooring mast in the world? Nothing much there now Donna. Just a little community. There is nothing there at the hotel site- just the mineral springs, and a cemetery. I am born and breed in Alabama and this is the first time I have ever heard about it. It is in true Alabama ways that it was allowed to ruin. Many States took their history and restored it, not Alabama. I remember going up in b’ham and them destroying the Parliament House on 20th Street, the old train station, the only thing I know they did not destroy was the Alabama Theater and the Antebellum Home in Westend. There was a White House Springs Hotel up on Colbert Hts south of Tuscumbia. We can’t find out much about it. 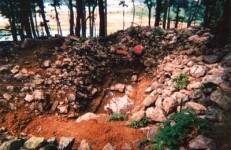 Only the springs and patio and foundation of the hotel remain. We have found an ad in one of the old newspapers. Like many of these resorts, it went under with the depression. My husband’s 1c4xr owned this place. My MiL (91) told me that they used to have reunions here. It is also called Borden-Wheeler resort. My GF has a old glass bottle here and it has Ingram’s lithia water with a embossed lady or man..I think its a lady ..and the bottle has Anniston Alabama on it . seems I read it came from a spa in Alabama that burned ..it was a big gathering place but can’t remember much. Anybody any info ? I have lived in Borden Springs all my life and my Dad is from Esom Hill, GA which is just up the road. 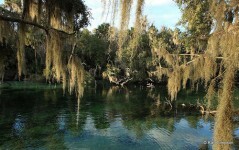 Borden Springs is a great community and has the most breathtaking scenery around. Thank you for sharing this. My mother, Vivian Wheeler Taylor, and her family came from Borden Springs, Ala. The place is named after her ancestors. Her father was Henry Wheeler [born 1913] who was named after his grandfather. I’ve heard that Henry Wheeler, Sr. [born May, 1849–died 1921] had a store on the same site where my aunt and uncle, Inez & JW Sadler had a store in Borden Springs. I would love to have a photo of my great-great grandfather or one of his store if anyone has one. Thanks if you can help. My grandmother, Zenobia Carruth Borden, who married Evan B. Stotsenburg in 1892, was the daughter of Joel Elias (sometimes Eli) Borden, son of John Borden and his wife Catherine Matlock. I have been to where John and Catherine Borden are buried out on a farm in Borden Springs, but the old home place is, of course, long gone. I have somewhere a picture of the mill probably taken after the death of John Borden by one of his sons, and the letters written to Joel Borden by his brother about the death of their father. I also have a series of photos that I can’t identify of the ruins of what may be an old frame home that was perhaps log underneath. I’d love to know whether they are of the old Borden home. Does anyone have any pictures? These are dated on the back 1937 and the company was The Sutcliffe Co Incorporated. Jane, we now live on the creek where that mill was. We would love to have a copy of that photo. Have you found it? Kinda reminds us of the Hygeia Hotel of Chrleston – I mean Citronelle next to where the Bordens lived at Pushmataha Park next to the Neshoba Church and Mt. 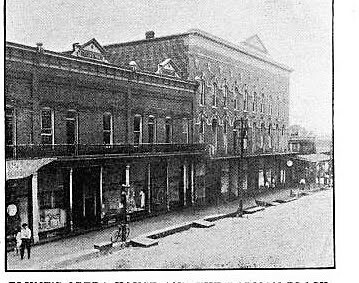 Nebo Citronelle before it became civilized. 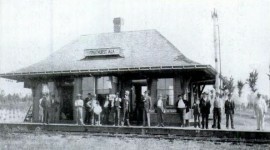 Wish it were still there—would love to go! Borden Springs is still a lovely area near the GA line. Would love to metal detect there. Wow what history!!!! We live down the creek from the old hotel, where the grist mill was.